SALT LAKE CITY (AP) — Jordan Loveridge scored 17 points and grabbed nine rebounds to lead a balanced attack as Utah held off a late rally to surprise No. 25 UCLA 74-69 on Saturday. Delon Wright, Brandon Taylor and Kenneth Ogbe each scored 12 points to help the Utes (14-4, 3-3 Pac-12) earn their first victory over the Bruins since the 1983 NCAA tournament. Kyle Anderson had 28 points, seven rebounds and seven assists for UCLA, and Zach LaVine added 15 off the bench for the Bruins. UCLA (14-4, 3-2) stormed back from a 17-point deficit to get within two in the final minute, but could not overcome a costly turnover by Anderson in the final seconds. UCLA drew within 12 points after Jordan Adams drained a 3-pointer for his first basket of the game to cut the lead 46-34. Utah responded with three consecutive baskets – punctuated by Loveridge’s 3-pointer – to take its largest lead at 53-36 with 12:47 left. The Bruins had one more run left in them. 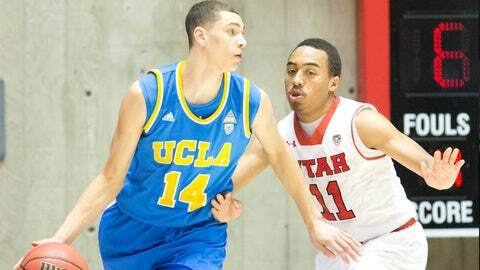 After Utah took a 60-45 lead on a pair of free throws from Jeremy Olsen, UCLA threatened the Utes with an 11-0 run. After Tony Parker made a layup with 6:01 left, the Bruins had cut Utah’s lead to four at 60-56. Utah boosted its lead back to nine at 69-60 on a corner 3-pointer from Dakarai Tucker with 2:34 remaining. The Bruins cut into the deficit again and made it a one possession game when Adams drained a jumper to cut Utah’s lead to 71-69 with 23 seconds left. Taylor made a pair of free throws to boost the lead back to four and Wright stole the ball from Anderson with 11.1 seconds left to seal the win. Utah found an offensive rhythm early by attacking from the perimeter. Taylor made 3-pointers on consecutive possessions and Onwas added a third long distance basket a minute later to give the Utes a quick 9-4 lead. UCLA turned to the same formula to erase the deficit. The Bruins caught Utah and took an 18-15 lead after Anderson buried consecutive baskets from distance to cap a 10-2 run. It didn’t take Utah much time to answer UCLA’s run with a bigger and better one. The Utes ripped off 15 unanswered points to race out to a 30-18 lead with 5:53 left before halftime. Loveridge and Wright helped fuel that spurt by driving to the basket and getting layups or free throws. Each player converted a 3-point play during that run. UCLA had trouble battling back because the Bruins offense stalled after starting strong early. The Bruins shot just 31 percent (9 of 29) from the field before halftime – nearly 20 percent below their season average. The worst part is UCLA missed 15 of 18 shots over the final 11:07 of the first half. UCLA endured a seven-minute stretch without making a field goal until Travis Wear made a jumper with 4:01 left. Subsequent back-to-back 3-pointers from Wear and Anderson helped the Bruins trim Utah’s lead to 32-26 with 2:06 remaining before halftime. Loveridge and Dallin Bachynski each scored a basket to put the Utes back ahead double digits going into the locker room. The Utes kept things rolling after halftime.